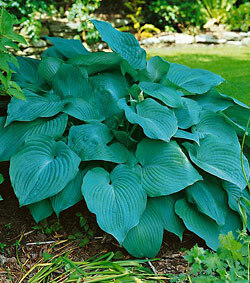 Gigantic glaucous leaves make this outstanding hosta an impressive sight throughout summer. Hosta ‘Blue Angel’ grows vigorously to 3’ high and spreads over 4’ wide to fill your beds and borders with exquisite, richly textured foliage in an intriguing blue-green hue. Individual leaves can reach immense size, growing 1’ long and up to 1-1/2’ wide! Then, summer brings a bonus – elegant, 4’ scapes of delightfully scented, pale lavender flowers that attract butterflies and hummingbirds and are great for indoor arrangements. Order our premium divisions today and enjoy this heavenly plant in your garden next summer.